Gerti’s baby bunny busted out! Now, about 4 weeks old, he’s ready to leave his tortoise ‘mom’s’ plush digs. I got to witness the event, one early morning,when I let the dogs out. The little guy had emerged from Gert’s house and was finally big enough to hop up on the wall and get his first glimpse of the big scary (and prickly) world that surrounds the tranquil tortoise garden. He sat on the wall for quite a while trying to decide if he really wanted to go out there. 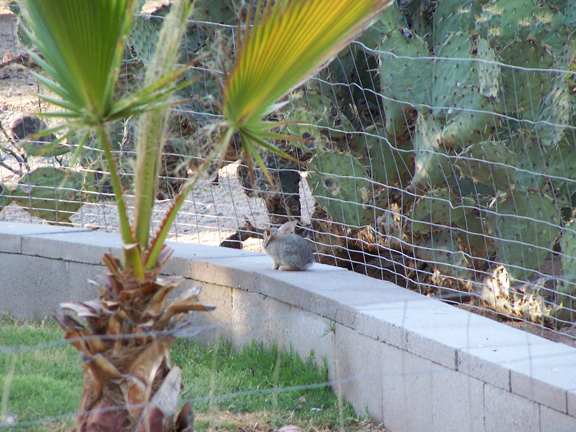 Then, finally he started hopping round and found a little spot in the fence where he could squeeze out. 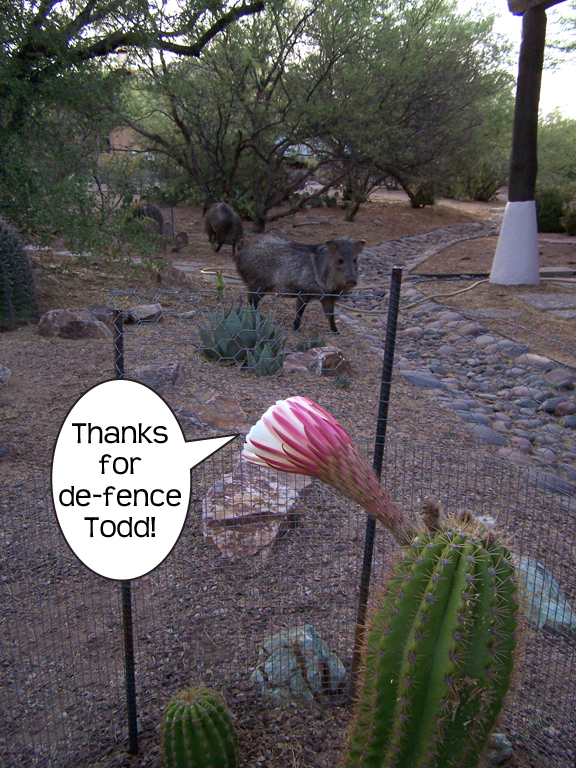 Once outside the fence, he scooted under the first prickly pear cactus he saw…the one where the rattlesnake lives. We wondered if we would ever see him again…and luckily, we have! He hangs out close to the house and we’ve seen him on several occasions. 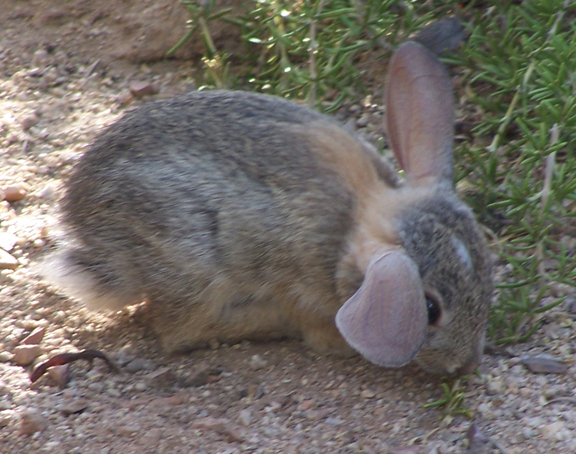 We can tell it’s him because his little ears stick straight out…not up! I’m thinkin’ that they grew that way, living in Gerti’s tight quarters for the first few weeks of his life! So adorable!!! 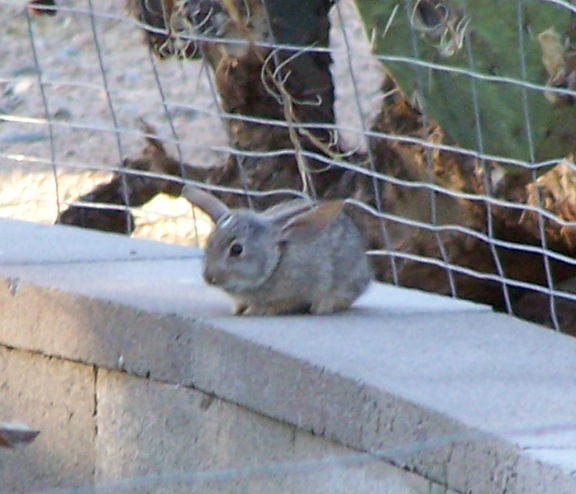 I call him Floppity:0 It’s fun watching him explore the yard and checking out the delectable array of desert edibles! Some of the other larger local varmints, have been checking out the delectable edibles as well. Although they are finding that some of them are now off-limits! awww so frickin cute!! I was wondering is that Jack’s Palm tree in the turtle habitat ? hasn’t grown much…must be another one….saw Donna’s post about your dog..so sad to hear, you have a new lil fella to watch over now, the backyard looks sooo lush!